We are massive Wizarding World fans in this house, so when Fantastic Beasts and Where to Find Them was released we couldn't wait to see what this new addition to the universe would include. Whilst we haven't yet taken Max to see it at the cinema, he is fully obsessed with all that Newt Scamander and his pals have to offer. 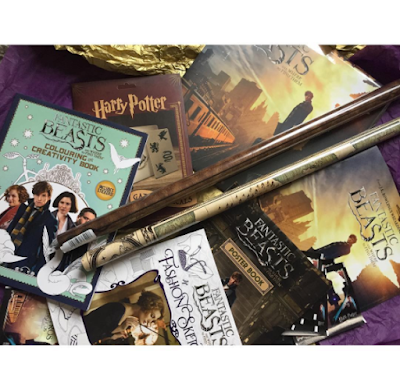 We were recently sent a giant case of Fantastic Beasts goodies to keep us occupied this Christmas holiday and as we opened the gorgeous gold and purple box we gasped at the treats we had inside! A set of Harry Potter gadget decals from Paladone which have ended up everywhere and anywhere and look fantastic. A Fantastic Beasts calendar from Danilo, which is perfect as we are always really indecisive when it comes to calendars and we are always in desperate need of one come January! A Panini Sticker album with lots of stickers. We absolutely love this and at only 50p a pack, the stickers are brilliant stocking fillers and pocket money treats this Christmas break. We all spent most of an afternoon looking at what stickers we had and what we needed to get to finish the book. We are massive fans of the heat sensitive creature stickers. Some Fantastic Beasts books from Scholastic, including a poster book, creative colouring book and Fashion sketchbook. I've been sketching away in the fashion book when I need a few minutes de-stressing this Christmas break, whilst Max has been colouring away and learning about all the creatures for when he watches the film. There are so many Fantastic Beasts treats out there this Christmas that there is literally something for everyone! We are in love with all the gifts we were sent and can't wait to really get stuck in now Max has finished for Christmas. *Note, we were sent these gifts, but all opinions are our own.